Carlthorp School | Kindness is Cool! The Kindness Club is Spreading Joy at Carlthorp School. The Kindness & Community Club has been spreading joy and it is contagious! 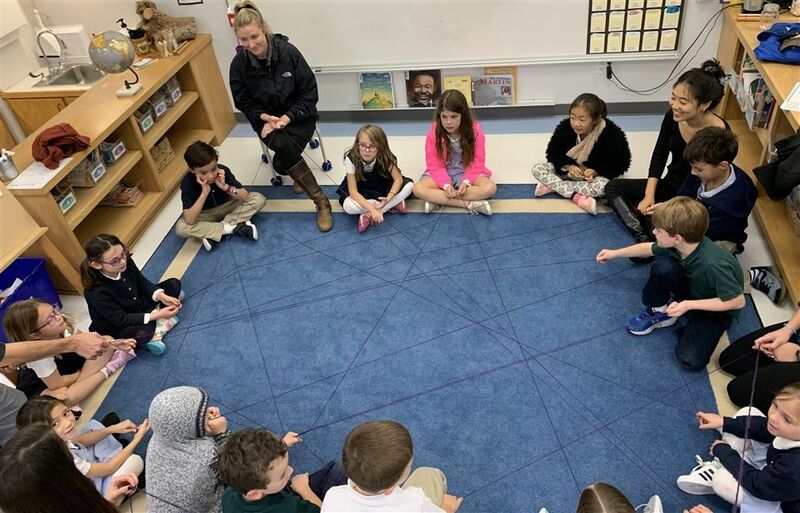 One of the many after school clubs offered as an extension to the school day, the Kindness and Community Club provides students in K-3 with the opportunity to participate in acts of kindness and community building both on campus and throughout the immediate Santa Monica community. Each session has a theme such as kindness to yourself, kindness to our families, and kindness to Carlthorp to name a few. Kindness can take many forms, and shows itself in ways both big and small. We are encouraged to practice being kind to others, but don't often consider being kind to ourselves. This was the jumping off point for the first session: being kind to ourselves. The group read I'm Gonna Like Me: Letting Off a Little Self-Esteem by Jamie Lee Curtis and Laura Cornell. As a group, the students discussed ways the main character was kind to herself, such as when she felt brave or answered a question incorrectly in school, when she was generous or when she got chosen last for a team. 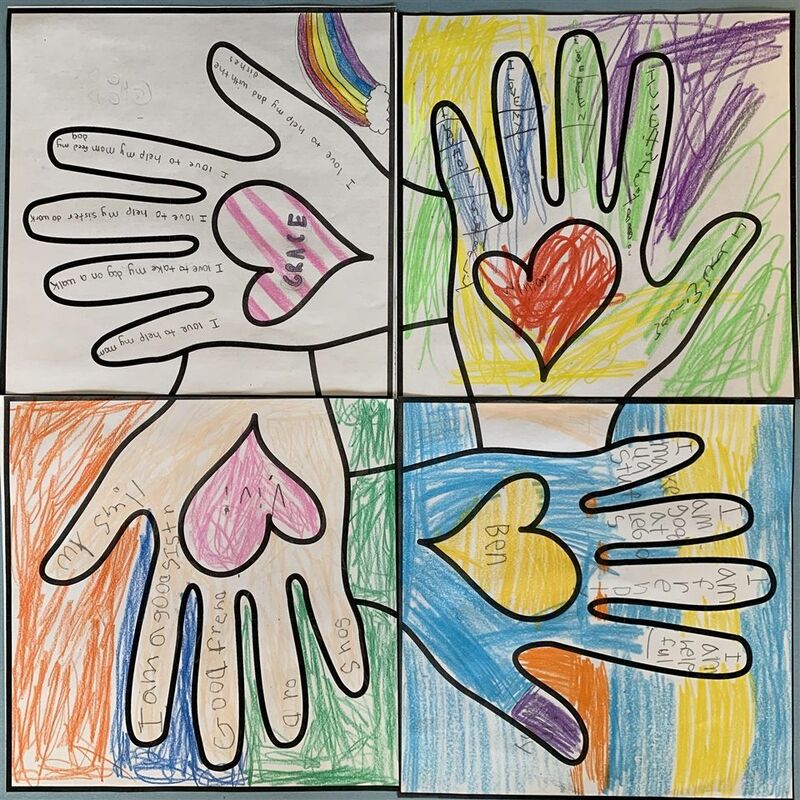 Then the students each wrote 5 things they like about themselves on a hand outline; each of these pieces fit together to create a quilt of kindness. Finally the club gathered together on the rug and shared with the group one thing each member likes about themselves. As each person shared, a length of string was passed, creating a web of kindness. The circle of kindness was expanded from focussing on ourselves to focussing on our families. Students chose a colored pouf from a bag with each color representing a different question that was answered by the group: what does it feel like when someone is kind to you? ; what makes you happy? ; what is something kind a family member has done for you? and what can you do or say to be kind to a family member? The club read How Full Is Your Bucket?and learned that everyone has an invisible bucket. When the bucket is empty we feel bad, but when it's full we feel great. Our kind words and actions not only fill others’ buckets, they also fill our buckets too! With this in mind, the children decorated jars for their families and filled them with kind words they'd written on colorful strips of paper. As they left for the day, the children also received two roses: one for the person who picked them up, and a second for a person of their choosing. Those roses really spread joy on campus and beyond. The club continues to broaden the circle of kindness to the Carlthorp community. Collaborating in groups, the children chose a variety of materials that they assembled to create unique messages of encouragement and inspiration. The groups then spread across the campus to post their kindness posters! Every single classroom as well as the front office and administrative offices received a message of kindness. When students regrouped in the classroom, they discussed how it felt to make and distribute the posters. One child commented, "I felt like Kindness Santa leaving a surprise!" The children also observed how good it felt to do something so simple, easy and enjoyable for their school community.